Dril-Quip offers various different riser connectors based on application FRC, PR-80™ and PR-85™ Riser Connectors, along with its subsea wellhead system, wellhead tie-back connector and surface production tree product lines. This has enabled Dril-Quip to offer the entire production riser string for Spar and TLP Floating Production vessels. Dril-Quip offers complete drilling and production riser systems available with universal riser spider to run all production and drilling riser joints. Dril-Quip’s PR-80™ and PR-85™ Riser Connectors, along with its subsea wellhead system, wellhead tie-back connector, surface wellhead system and production tree product lines, have enabled Dril-Quip to offer the entire production riser string for Spar and TLP Floating Production vessels. 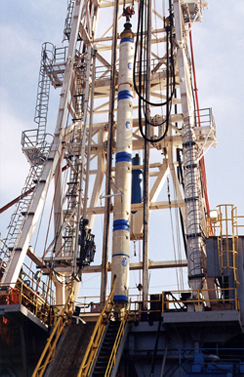 Dril-Quip offers complete drilling and production riser systems available with universal riser spider to run all production and drilling riser joints.